Women in Aviation International, India Chapter and Lockheed Martin India in association with Airport Authority of India (AAI) today celebrated Girls in Aviation Day at Goa Airport. With the vision to encourage girls to take up STEM subjects and explore career opportunities in related industries, the initiative is aimed at showcasing opportunities in the aviation and aerospace sectors. This initiative also aligns with the Government of India’s Skills India initiative. As part of the program, Women in Aviation International (India Chapter) invited 60 students from various schools for a tour of Goa Airport. Visiting students were given an opportunity to explore, learn, and discover the various aspects of and roles in aviation and aerospace such as air traffic controller, airline dispatch, pilot, aviation maintenance technician, aeronautical engineer or aviation management. In addition, the girl students were given a tour of the ATC Tower, Airside, Terminal Building and AOCC and all their queries and questions were answered by the officials working in the respective departments. “We will continue our endeavour to introduce young girls to role models and educate them in a fun and supportive atmosphere. We are very fortunate to be able to partner with Lockheed Martin India and Airport Authority of India for this event. Their efforts in leading youth into STEM careers is truly commendable.” added Mrs. Bhatia. Speaking about Lockheed Martin’s commitment to this initiative, Mr. Phil Shaw, Chief Executive, Lockheed Martin India Private Limited said, “Lockheed Martin is delighted to support the Girls in Aviation Day initiative and see it grow from strength to strength. We are passionate about encouraging young ladies to broaden their horizons and consider pursuing an education in Science, Technology, Engineering and Mathematics (STEM) and consequently, careers in aerospace and technology. Lockheed Martin views education as a crucial investment for both business and society, and looks forward to helping develop the next generation of engineers, explorers and scientists in India." Post the airport tour, the students were given a presentation about the industry and its intricacies. Also, an impromptu quiz competition added to the delight of the students who won small tokens as prizes. Students were given an opportunity to interact with Ms. Mridula Sinha, Governor of Goa and chief guest for the event as well as Mrs. Radha Bhatia, President Women in Aviation International (India Chapter), Mr. BCH Negi, Airport Director, Goa Airport, Mr. Phil Shaw, Chief Executive, Lockheed Martin India. Students also interacted with several other founding members from Women in Aviation International (India Chapter). 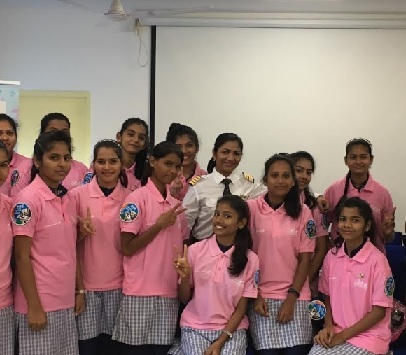 Since its inception in 2015, Women in Aviation International (India Chapter) has reached out to over 1500 young girls to encourage them to undertake STEM subjects and explore career opportunities in aviation related industries. Women in Aviation International India Chapter is a non-profit organization dedicated to the encouragement and advancement of women in all aviation career fields and interests. The India Chapter provides networking, mentoring and scholarship opportunities for women who are striving for challenging and fulfilling careers in the aviation and aerospace industries. For more information, please visit: http://www.indianwomenforaviation.in. For more information, please visit: https://www.lockheedmartin.com.